You can download the HANS QUICK START GUIDE (English) here. Or the Spanish version of the HANS QUICK START GUIDE here. Deciding on the Correct Angle and Size of HANS Device. It's easy to choose the right HANS Device for you. First choose the angle that matches your car, then choose the size (small, medium or large) most comfortable for your body. In all cases driver comfort is the deciding factor. Fits many Sprint cars. Fits many people weighing under 75 lbs. in an upright seat. If you sit very upright and cannot get comfortable with a Model 20 try this Model. Fits all sedans including NASCAR, Busch, Sprint, Midget, Quarter Midget, Drag, Modified, Bandalero and similar. All sportscars including Porsche, BMW, Corvette, Honda, Viper etc. All Panoz Racing Series cars. Marine applications including UIM and Drag Boats. NOTE: Driver over 200lbs. may find a Model 30 more comfortable in the vehicles listed above. The Model 40 is a rare application and fits extremely reclined seats such as Vintage Formula Ford and Bonneville cars. Please measure your seat (use an angle meter available at DIY-type stores) before ordering. 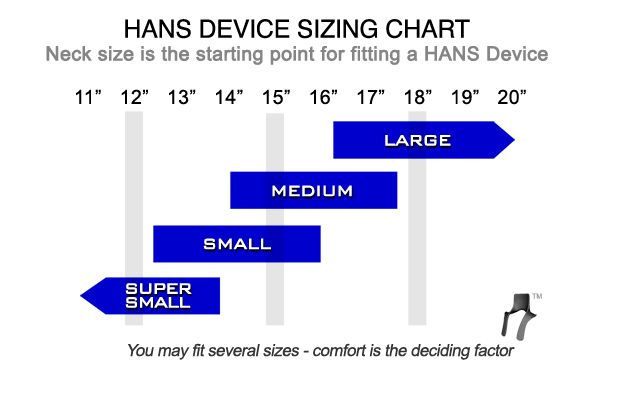 See chart below to determine which HANS Device fits you. Due to differences in torso shapes, it is difficult to predict exact fitments. The HANS Device is the only head & neck restraint that allows exceptional vision via slack tethers and exceptional safety due to the way it works. The slack in the tethers is automatically taken up during impact. For information on how to adjust your tethers to factory specs go here to download Quick Start Guide. No. Properly mounted belts do not slip off the devices with properly installed factory rubber stripping on the shoulder/restraint portion of the device. If your shoulder belts will not stay securely on the device chances are that you do not have the belt mounts properly located in your chassis. For more information see the Quick Start Guide section on shoulder belt mounting go here to download Quick Start Guide. Because the HANS Device is the only frontal head restraint that directs the loads thru the forehead area, you can use an open face helmet with the HANS Device too. Only the HANS Device is available in 4 angles and 5 sizes to match any application. How do I care for my HANSå¨ device? Tethers are dated. Replace every 5 years, after major impacts or sooner if wear is observed. My helmet was pre-drilled by the manufacturer for HANS Device anchors. What do I do? There's a ridge or air vent preventing me from following your Helmet Anchor Installation guidelines. What do I do?